Where Does Jon Snow Go From Here On Game Of Thrones? Spoilers from Season 6, Episode 3 "Oathbreaker," as well as potential spoilers are all over this article. If you haven’t caught the episode yet, please turn away now, but feel free to browse our other excellent articles. Following last week’s big Jon Snow resurrection reveal, this week we got an episode that moved slowly and was more about carefully worded dialogue than action. However, one big moment did occur at the very end of the episode. Jon Snow, newly resurrected and with a lot of things weighing on his mind, ultimately opted to execute the group of people involved in his stabbing at the end of Season 5, which meant not only did Alliser Thorne bite the dust but Olly met his downfall at the end of a rope, too. Following their deaths by hanging in front of the rest of the Night’s Watch, Jon Snow made an even more unpredictable move, seemingly quitting the Night’s Watch altogether. So, where does Jon Snow go from here? Honestly, months and months ago, before we knew Jon Snow had actually died as a result of the stabbing and before we knew he would be resurrected by Melisandre thanks to some coaxing from Ser Davos, it seemed probable that the character was too important to the overall narrative to be gone from Game of Thrones completely. Plenty of theories surfaced about what Jon Snow could be up to in Season 6, and while the easy route would keep him in charge of the Night’s Watch and off to fight the White Walkers, right now, he doesn’t seem to be headed in that direction, at all. The lord let you come back for the reason. Stannis was not the prince who was promised, but someone has to be. Obviously, there is no longer a blueprint from George R.R. Martin’s novels to go off of concerning this particular plotline, but there have also been hints from the set of Game of Thrones that snuck their way onto the internet over the last several months. Showrunners David Benioff and Dan Weiss have spoken a lot about an epic battle scene that is set to occur during Season 6. Just because there’s a battle scene doesn’t mean Jon Snow is involved, but other set reports have indicated Kit Harington—who plays Jon Snow—was also seen filming an epic scene with Sophie Turner, who plays Sansa Stark and Ramsay Bolton at Winterfell. Plus, there’s a bit in the trailer from (what looks to be) a battle which seems to show Jon Snow in the background. All in all, these reports help to support the fact the character is headed away from the Wall, as he seemed to intend at the end of the episode. The pieces of background information found in the last couple of paragraphs could also intersect somehow. There’s always a chance that the final scene of “Oathbreaker” featured a classic bit of misdirection, but given what we know about the upcoming episodes, there’s a good chance that when Jon Snow uttered “my watch has ended,” he meant it. 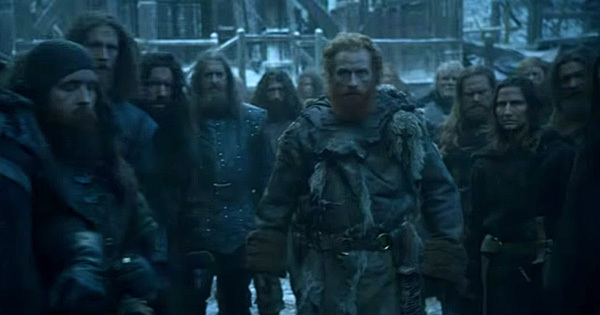 Technically, he may be breaking an oath with the Night’s Watch with his decision, but given the fact he was actually murdered, thus ending his watch, he might get a pass here. We’ll find out next week, when Game of Thrones airs on HBO at 9 p.m. ET.